Exciting news for a Thursday afternoon. I have been invited to review an item from CSN Stores. They have OVER 200 websites, with everything from bookshelves for our book bloggers to this really fun bedroom furniture. I absolutely said YES and immediately went looking for a bookshelf to add to the collection and possibly found a bed to order too! After shopping on their websites, I found one that can be hung on the wall. After I receive it and I review it, I am sure we will order another to have a matching pair!! 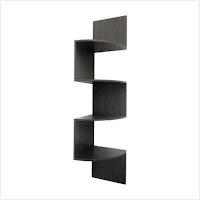 Here is the bookshelf that will be arriving at my house and once it is hung and loaded with books and things, I will let you know what we think!! Click on the picture to have purchase one for your home!! Stopping by 4 bloggiesta....Good luck..I hope that you're able to get a lot accomplished. We got our review bookshelf put together over the weekend so I really need to get that post written now! Thanks for stopping by Library Girl Reads. I'm now following you as well.